The object of the game is to attain a higher score than your opponent alliance by scoring tubes upon goalposts, owning goalposts and by low hanging or high hanging from the ladder. A bonus is awarded to the alliance that has the most total points at the end of the Autonomous Period. There are a total of forty (40) – twenty (20) red and twenty (20) blue – tubes available as scoring objects in the game. Thirty-six (36) of the tubes will start at designated locations on the field; while two (2) will be available to each alliance prior to the match. 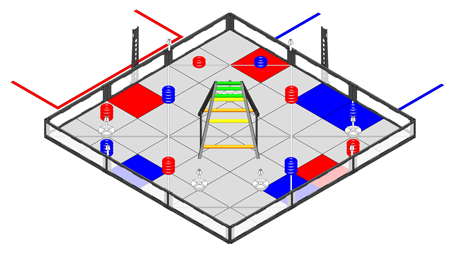 Each robot (smaller than 18”x18”x18” to start) begins a match on one of their colored alliance tiles. There are nine goalposts, five of which are attached to movable weighted bases, which teams can score tubes on. Alliances earn extra points for owning a goalpost by scoring more tubes on the goalpost than their opponents. At the center of the field is a 36” high structure known as the ladder that teams can climb or hang off of for additional points. Robots earn different point values for being at least 6” (low hanging) or 18” (high hanging) off the ground. Tournament Champion 1492Z W.A.S.A.B.I. Robotics Big Brains Education Washington, U.S. Programming Skills Champion 1103 Currahee Homeschool Ohio, U.S. Robot Skills Champion 1103 Currahee Homeschool Ohio, U.S. Excellence Award 254 The Cheesy Poofs Bellarmine College Prep California, U.S.